Fashion designer Zac Posen has designed Delta’s new uniforms for its more than 60,000 frontline employees, unveiled by the airline Tuesday. 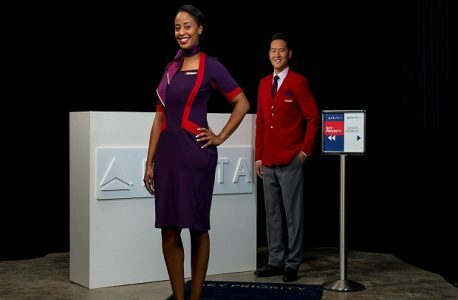 Delta CEO Ed Bastian called the new uniforms “classically influenced, yet modern.” They feature three main colors: “passport plum,” “cruising cardinal” and groundspeed graphite,” with “skyline slate” and “traveling thistle” accents. Female customer service agents and flight attendants will wear new items like a plum v-neck dress, peplum sweater, ottoman skirt suit and wrap dress. Men will wear a three-piece suit in graphite and a crew-neck sweater in plum with a tie featuring a Delta logo print. Posen’s designs will be sported by flight attendants, customer service agents, ramp agents and technicians. Non-customer-facing employees will also have new uniforms, designed by retailer Land’s End with consultation from Posen. A team of 1,000 “employee ambassadors” will start testing the uniforms starting this December. To see more images of the new uniforms at Travel Weekly, click here.